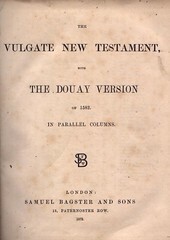 Title The / Vulgate New Testament, / with / The Douay Version / of 1582. / in Parallel Columns. / London: / Samuel Bagster and Sons / 15, Paternoster Row. / 1872. References HERBERT 1992; POPE 677-17. Facsimiles A Pdf facsimile is available at archive.org.